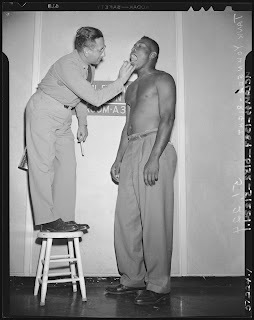 Title: Paul Younger's military physical exam. Creator/Contributor: Daily News (Los Angeles, Calif. : firm), Publisher. Date: ca. 1950. Say ahhh. This is a very tall patient or a very short doctor. I hope the doctor isn't afraid of heights. I received this email from my mother today, and I about spit Pepsi all over my computer screen as I read through this list. I’m sure everything in this letter is true because no one can make all of this stuff up. Enjoy! 1. A man comes into the ER and yells, "My wife's going to have her baby in the cab!" I grabbed my stuff, rushed out to the cab, Lifted the lady's dress, and began to take off her under- wear. Suddenly I noticed that there were several cabs ---and I was in the wrong one. 3. One day I had to be the bearer of bad news when I told a Wife that her husband had died of a massive myocardial infarct. Not more than five minutes later, I heard her reporting to the rest of the family that he had died of a "massive internal fart." 4. During a patient's two week follow-up appointment with his cardiologist, he informed me, his doctor, that he was having trouble with one of his medications. "Which one?" I asked. "The patch, the Nurse told me to put on a new one every six hours and now I'm running out of places to put it!" I had him quickly undress and discovered what I hoped I wouldn't see. Yes, the man had over fifty patches on his body! Now, the instructions include removal of the old patch before applying a new one. 5. While acquainting myself with a new elderly patient, I asked, "How long have you been bedridden?" After a look of complete confusion she answered. "Why, not for about twenty years - when my husband was alive." 6. I was performing rounds at the hospital one morning and while checking up on a woman I asked, "So how's your breakfast this morning?" "It's very good, except for the Kentucky Jelly. I can't seem to get used to the taste" the patient replied. I then asked to see the jelly and the woman produced a foil packet labeled "KY Jelly." 7. A nurse was on duty in the Emergency Room when a young woman with purple hair styled into a punk rocker Mohawk, sporting a variety of tattoos, and wearing strange clothing, entered. It was quickly determined that the patient had acute appendicitis, so she was scheduled for immediate surgery. When she was completely disrobed on the operating table, the staff noticed that her pubic hair had been dyed green, and above it there was a tattoo that read, "Keep off the grass." Once the surgery was completed, the surgeon wrote a short note on the patient's dressing, which said, "Sorry, had to mow the lawn." 8. As a new, young MD doing his residency in OB , I was quite embarrassed when performing female pelvic exams. To cover my embarrassment I had unconsciously formed a habit of whistling softly. The middle-aged lady upon whom I was performing this exam suddenly burst out laughing and further embarrassing me. I looked up from my work and sheepishly said, "I'm sorry. Was I tickling you?" She replied, "No doctor, but the song you were whistling was, "I wish I was an Oscar Meyer Wiener". Now that you have had your chuckle for the day, head on over to Emergiblog for Change of Shift. Kim put together another great selection of posts to keep the good times rolling. Your mother consistently sends good emails. Thanks for cheering up my day. I esp. love #3 and #5.